This is a completely customized Army Cake Topper ordered by one of our customers. For the pose, they would like to have the groom carrying the bride with their dog at groom's feet. 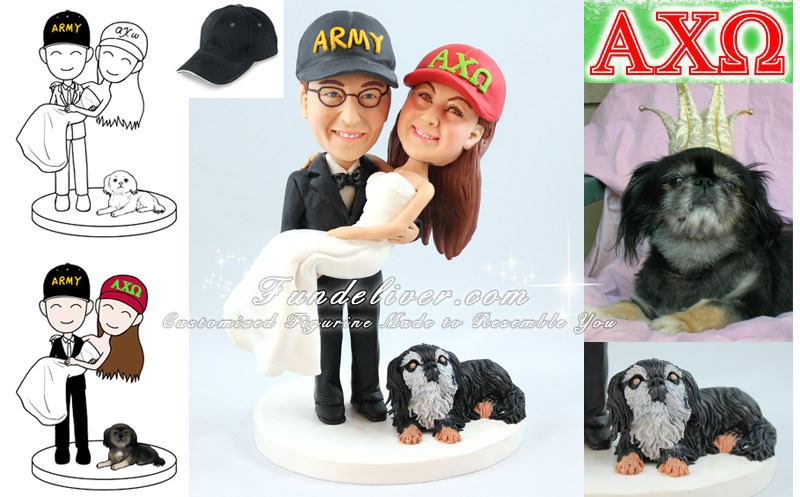 Groom wears a baseball cap that says 'ARMY' in black with gold lettering and bride wears a baseball cap that says the Greek letters 'Alpha Chi Omega' in red with green lettering. The reason they had the baseball caps that say 'Army' and 'Alpha Chi Omega' is that groom was an Army officer for many years, and bride is a member of Alpha Chi Omega. It's a social sorority - club - in colleges around the United States. Also, she is a volunteer for the sorority and do some travel work for them. All sororities have special color combinations, and theirs is red and green. That's why the hat that she asked for on her statue was red and green. 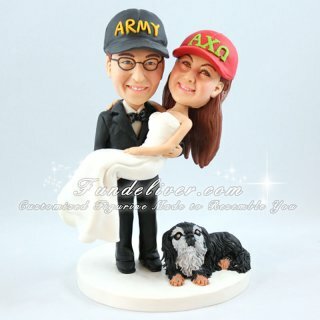 Love this Army and Bride Wedding Topper or Army Officer Wedding Cake Topper, why not get your occupations or interests involved in your wedding cake topper?